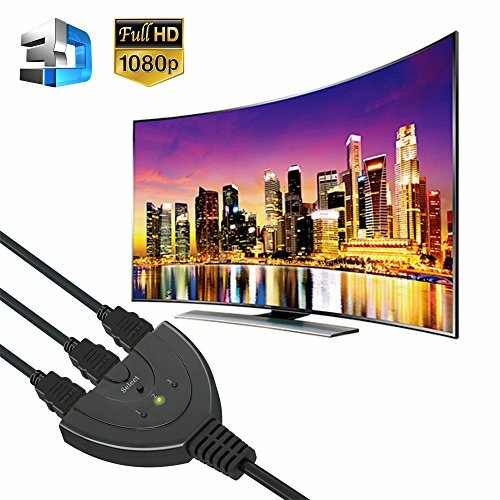 1080P RESOLUTION SUPPORTED - This HDMI switch supports HDTV deep colour, 1080P resolution (1920x1080P) and 3D video. 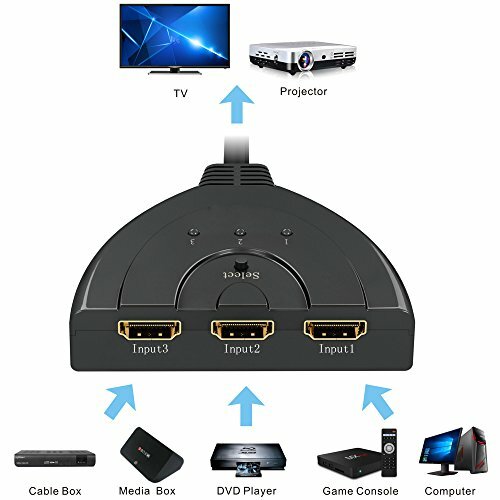 3-PORT HDMI SWITCH - 3 HDMI ports in and 1 HDMI out for various HDMI devices. 3 HDMI source devices to be connected and manually selected to play, to avoid constantly plugging and unplugging. PLUG AND PLAY - No extra power required. The HDMI switch will obtain power automatically from the source devices through the HDMI ports. 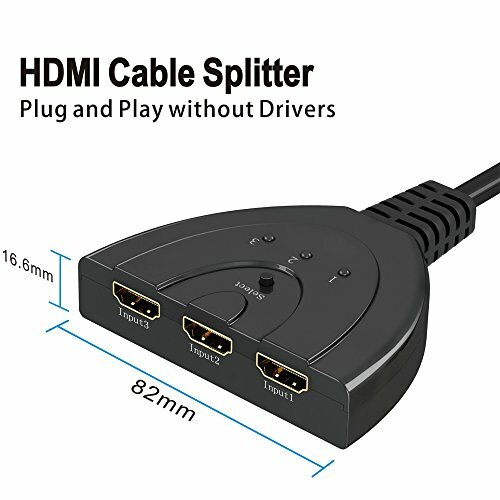 GOLD PLATED HDMI INPUT AND OUTPUT - 24k gold plated connector resist corrosion, reduce tarnish and increase transmission performance. HD AUDIO AND HDCP COMPLIANT - Audio Formats: LPCM, DOLBY AC3, DTS7.1, Direct Stream Digital. No distortion of audio or video, no delay in signal transmission. The HDMI switch is to connect more source devices to display on one screen (TV, projector or LED monitor). This switch with 3 input ports can connect 3 devices at the same time which can avoid frequent disconnection and reconnection. Save your time and money. This HDMI switch is updated with 1080P video transmission supported. HDTV deep color and 3D video are supported as well. 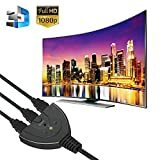 You can enjoy high quality movie at home or build your own home theater. No extra power cable is needed to make this switch work. 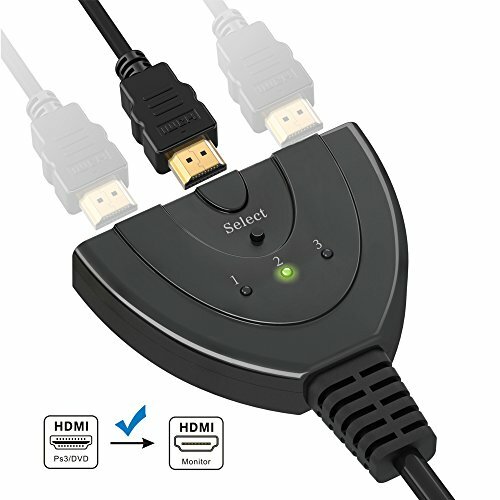 As long as the connected devices supply sufficient power, the HDMI switch is capable to automatically obtain power from connected sources devices. Video supported: 1080P, HDTV deep color. MAC Notebook, XBOX360, PS3, PS4, Nintendo Wii U, Laptop, PC, TiVo, Vizio, Sony and many more. 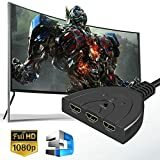 devices / Backward compatible with older HDMI devices and gadgets. 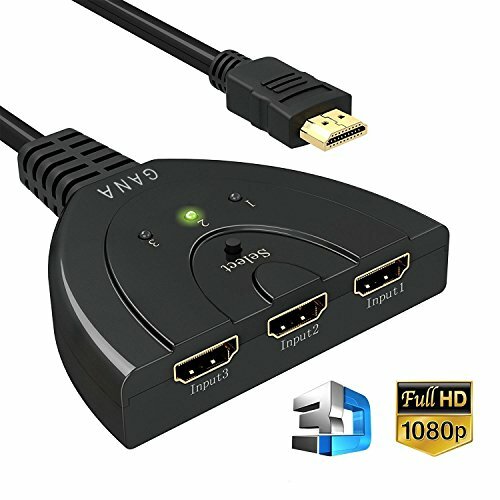 1)For some devices, the HDMI switch may not work when only one input device is power on due to insufficient power. In this case, please turn on two or all the three source devices to try. 2)This switch is for 3 signal hosts to connect to 1 TV. It could not be connected to 2 or more TVs/Monitors.